Aluminum Tank & Tank Accessories, Inc. has been granted a Special Permit from the the U.S. Department of Transportation that authorizes the manufacture, make and sale refueling tanks for use with Diesel, Gasoline, Kerosene, Ethanol, Methanol and Aviation Fuel. Must be carried aboard each vehicle using a refueling tank at all times! 1. 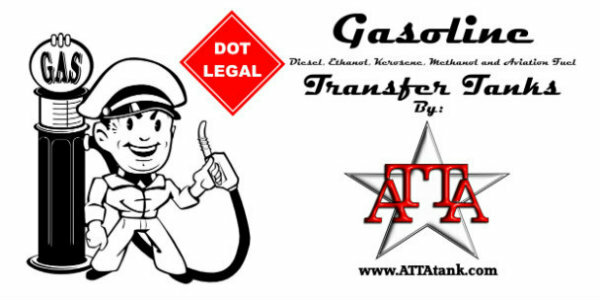 ATTA, Inc. Special Permit #20416 is valid for use with Diesel, Ethanol, Gasoline, Kerosene, Methanol and Aviation Fuel. The end user is responsible to read ATTA, Inc. Special Permit #20416 before use. 2. Warranty card must be returned to ATTA, Inc. within 30 Days of purchase. Failure to return warranty card will void warranty. 3. Special Permit is valid for 2.5 years from date of manufacturing. 4. Refueling tanks must be retested every 2.5 years in accordance with 49 CFR 180.352. The end user is responsible to keep refueling tank within 49 CFR 180.352 regulations. 5. In order to maintain ATTA, Inc. manufacture warranty for refueling tanks, the refueling tank must be maintained within accordance of 49 CFR 180.352 at all times. Failure to have refueling tank retested every 2.5 years will void warranty. ATTA, Inc. must receive documentation of retesting within the 2.5 years limit to maintain ATTA, Inc. manufacture warranty. Failure to send ATTA, Inc. retesting documentation within the 2.5 year limit will void ATTA, Inc. manufacture warranty. 6. Refueling tanks must be attended at all times by a qualified person within accordance of 49 CFR 177.834. Do not leave refueling tank unattended. 7. No modification of refueling tanks is allowed. Do not weld on any fuel tank. Failure will void warranty. 8. Always use proper venting techniques with all fuel tanks. 9. All fuel tanks must be installed per instructions with no exceptions. Transfer pumps must be installed per manufacture requirements. 10. Vehicle with refueling tank installed must be turned off when transferring fuel. Any vehicle or equipment of which fuel is being transferred to must be turned off. Do not transfer fuel near any heat source or open flame. Only transfer fuel in well ventilated areas. Any questions please call us at 1-800-773-3047.